Free to Play Woblox, start your free game now (2016). 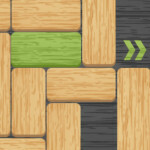 Description: Slide the green block until it reaches the green arrows at the other side. Have fun in this crazy puzzle game!